The world’s largest soccer tournament is just around the corner, but you don’t have to be in Brazil to celebrate the soccer craze with your entire family. There are plenty of fun ways to gear up for the festivities at home – and score some fun in the process. To help kick off summer in entertaining fashion, consider spending quality time together with these family-friendly soccer activities. Play a game of “Red light, Green light.” You don’t need teams of 11 players to have fun with a soccer ball. Consider a game of “Red Light, Green Light,” which can be played with only a handful of people. Line up any number of players, each with a soccer ball, facing one person who serves as a “caller.” The players dribble a soccer ball toward the caller, who starts the action by yelling “green light.” When the caller says red light,” they must immediately freeze, while stopping the ball. If a player moves or allows the ball to roll after “red light” is called, that player must take five steps back. The first person to cross the finish line gets to call out the commands for the next round. Throw in an unexpected element. Make things more interesting by tossing the new M&M’S M-Ball into the mix. The bright yellow M-Ball is a fun twist on a traditional soccer ball, shaped to resemble the iconic M&M’S Peanut candies. The unconventional design sends the ball spinning into unpredictable directions, which levels the playing field for people of all skill levels. You can set up a designated goal to aim for, or form a circle and attempt to kick the M-Ball to each other. No matter how you set it up, it will undoubtedly be a good time. You can get your hands – or feet – on the M&M’S M-Ball by entering an instant win contest on Facebook or by visiting a retailer featuring an M-Ball display. 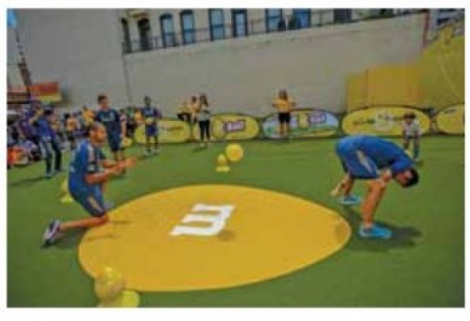 Find out more information at www.facebook.com/mms, where you can also see soccer stars from the LA Galaxy and the Philadelphia Union test out their skills with the unpredictable M-Ball. Set up an obstacle course. Here’s a challenge: Create an obstacle course for soccer lovers. Gather cones or other objects from around the house to use as obstacles. Line them up and yell out a combination of moves needed to complete the course, such as dribbling around the obstacles and kicking the ball. Feel free to get creative here and throw in some other tricky moves, like hopping through hula hoops, performing a cartwheel or completing a somersault. Quiz them with soccer trivia. The twenty white patches on a soccer ball are in what shape? (Hexagon) Which country will host the big tournament this summer? (Brazil) How many black patches are on a typical soccer ball? (Twelve) How many teams compete in the global tournament? (Thirty-two) With the world focusing on the sport of soccer this summer, get the whole family involved and excited about the game with these interactive activities.